Copyright: ©2017, Ostrale Zentrum für zeitgenössische Kunst e.V. 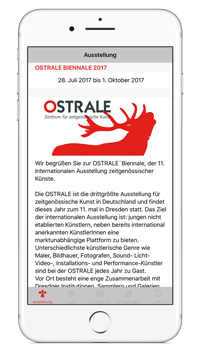 Allsense is an app offering information about the Ostrale, an exhibition for contemporary arts held in Dresden. The app’s main feature is an audio guide allowing visitors to view selected works of art. The guide aims to introduce blind and partially sighted people to contemporary arts, but it may be used by everyone. Red, tactile floor indicators have been installed in the exhibition space to lead visitors from one audio-described exhibit to the next. As soon as you approach one of the exhibits that are part of the audio tour, you will automatically hear its description. Playback is triggered by a Bluetooth beacon installed in its proximity. 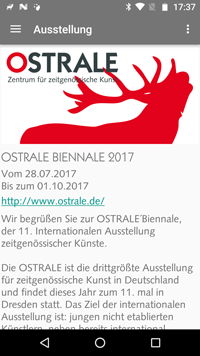 You may visit Ostrale until 6 October and try it yourself.